Meg has been a student of various forms of Yoga and Meditation since 1997, and was certified 15 years ago. Her down-to-earth, generous and loving classes are living labs for self-discovery, acceptance and truth. Meg holds certification in Holistic Himalayan Yoga, Vinyasa, Ashtanga (from Manju Jois ~ son of the founder of Ashtanga Yoga), Meditation, Theory (from Kaivalyadhama Institute), Anatomy (Leslie Kaminoff), Reiki, and Sound Healing. She is a E-RYT 500 and Founder/Director of a 200hr, 300hr and 500hr RYS (Registered Yoga School), the first school ever to be registered on the island of Isla Mujeres in Mexico with Yoga Alliance. Red Buddha Yoga & Wellness is one of the few schools in Mexico to hold trainings at the 500hr level. Meg has taught in Costa Rica, Mexico, Haiti, Jamaica, Guatemala, USA and aboard the MSC Poesia. She has traveled to India, Nepal & Japan to deepen her knowledge of Meditation, Yoga, Sanskrit and Eastern Philosophy. She attributes learning the most from her time with ~ Kino Macgregor (Ashtanga Yoga), Edwin F. Bryant PhD (former Harvard & Colombia professor, one of the leading Indologists in the world), Sharath Jois (grandson of Shri K. Pattabhi Jois), Manju Jois (son), Tim Miller (Ashtangi). Meg will be teaching 200hr, 300hr and 500hr courses throughout 2018 in Mexico and abroad. Yogi Sivadas of Kailash school in Mcleod Ganj India gave Meg the name "Yogini Padma". Keiko completed her 200 Hour Teacher Training at Synergy Yoga in Miami Beach with Victoria Brunacci. She currently teaches yoga at Maham in Miami Beach as well as gives private lessons. Keiko is originally from Miami, FL and grew up as a dancer. She holds a bachelor's degree from University of Miami and a Doctorate of Physical Therapy from Columbia University in New York. She has worked as a physical therapist for over 10 years and is an adjunct professor at University of Miami and Florida International University. 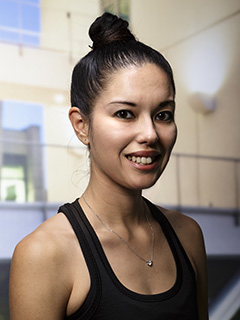 Keiko specializes in performing arts physical therapy, pediatric/adolescent therapy, and sports physical therapy. She worked with the Miami City Ballet as their company physical therapist and now works for touring Broadway productions at the Adrienne Arsht Center. Keiko began practicing yoga over 15 years ago when she was living in New York City. Her preferred style of yoga is Ashtanga Vinyasa. She enjoys teaching musculoskeletal anatomy and injury prevention to yogis to help them understand their bodies and develop a safe practice. Keiko joined Red Buddha in 2016 as a lecturer for the teacher training program. As a Holistic Practitioner, I believe we need to consider Mind, Body and Spirit. We are all unique individuals. My goal is for every client to be successful, therefore I will develop a unique wellness plan based on your needs. My strategy is to teach you and give you the tools necessary to make informed decisions about your health and lifestyle choices. No diets! My belief is that our bodies are miracle machines and given the proper tools…can heal naturally! I am a Registered Holistic Nutritionist from the Canadian School of Natural Nutrition, a Personal Training Specialist from CanFitPro, and a Chemistry geek from the University of Western Ontario. My education combined with my passion for cooking, eating and fitness makes the perfect combination for your guide to health and fitness. What is an RHN? A Registered Holistic Nutritionist is a professional, with a set code of ethics, trained in Natural Nutrition and complementary therapies, whose principal function is to educate individuals and groups about the benefits and health impact of optimal nutrition. Lucia is currently living on Isla Mujeres promoting a healthy lifestyle. She feels so fortunate to have met Meg DeClerck at Red Buddha Yoga & Wellness. With Meg’s gift for Yoga and Meditation and Lucia’s passion for Food and Fitness, they are able to offer their clients a complete program that incorporates Mind, Body & Spirit, Replenish. Marcia es una estudiante del Yoga, fascinada de los regalos que esta práctica le brinda. Originaria de Cd. Victoria, llega a Monterrey en el 2002 para continuar sus estudios profesionales. El Yoga la encuentra algunos años después, mientras ella busca un escape a la vida cotidiana. Inicia su práctica recorriendo distintos centros de la ciudad durante varios años, pero es hasta el 2012 que llega a Sattva Yoga, con una pasión creciente por ésta disciplina y con el sueño de profundizar en ella. En principio, su enfoque se centra en la práctica del Sistema Mandala Vinyasa. Posteriormente, intensifica su entrenamiento con clases como Ashtanga, Rocket, Raja y Método. En ese punto, el Yoga se convierte para ella en un estilo de vida. Así, en el 2013 decide ingresar al Entrenamiento para Profesionales de Yoga de 200hrs con Mayra Cadengo, apreciando a profundidad su filosofía y con la firme decisión de compartir su pasión con cuantas personas sea posible. Desde entonces, ha profundizado sus estudios asistiendo a diversos talleres y cursos con maestros reconocidos internacionalmente como Baptiste Marceau, Gerson Frau, Patrick Beach, Claudia González, entre otros. Actualmente, tiene experiencia impartiendo clases de Mandala Vinyasa Yoga. Su dinámica pero suave presencia, te conducen a una práctica personalmente gratificante. Como objetivo, compartir con sus alumnos un viaje al corazón. Para Marcia, “el Yoga es la constante integración conmigo misma; es ir a profundidad en mi mundo interno, fluyendo por medio de la respiración, entregando mi corazón en cada momento”. Marcia is a yoga student, fascinated by the gift this practice brings to her life. She began her yoga experience during college, while trying to escape from the never-ending routine, and it was until ten years lated that her growing passion for this discipline, lead her to her first teacher training with Mayra Cadengo. Determined to share her love for yoga with as many people as possible, she started dedicating full time to her passion. Marcia teaches multilevel Mandala Vinyasa Yoga, specialising on entry-level practices to welcome new hearts into the world of yoga. Her dynamic but gentle presence, will guide you on a rewarding journey to your self. For Marcia, "in my life as well as on the mat, yoga teaches me that it is ok to fall, as long as I keep trying. It teaches me to cultivate patience and teaches me to feel grateful for every moment I experience. I am stronger every day and in every way, and the best part is how I always find this strength inside me. But above all, yoga teaches me how to grow from fear to love. Yoga gives me a new way of understanding life, and my purpose in this world. It keeps me connected and aligned to what I know is my true self. After each practice, I always find myself reborn from the heart." The Mandala Vinyasa Yoga System, designed by Mayra Cadengo, is a fun practice in which you work sequences in a circular and fluid way strengthening the joints. Mandala is a practice that can be either performed very soft, keeping you in a state of meditation; or intensely, achieving a body detox trough sweat and massaging each of the organs in your body. Jesus “JAH” Soto born in a little town beside Mexico City in 1979, he was raised in a catholic family with Chinese descent and some other cultural influences. Jah has always felt attracted to the arts, music, athletics and spirituality~ but never fully grasped the unique relationship between them. At the age of 23, moved by his curiosity he decided to travel and move to Spain where he continued his studies in communication and arts history. He started a family in 2005 and raised his two daughters while working as a Chef, Freelance Graphic Designer and some other activities (skating and capoeira). In his early 30’s, Jah came back to Mexico after 8 years of living in Spain where He met his Master Lal Maharaj and made an incredible connection. He received his title as Siromani with Vastu School of Yoga in 2013 and since then has continued sharing the practice of Sri Guru Sivananda and spreading the word. Meraki: to do something with soul, creativity or love, leaving a piece of yourself in to what you are doing. This is the essence behind all of Niki's work. For her, the healing arts is not merely a job, but a way of living. Forever a student of yoga, bodywork, and life; Niki's journey in to the ever exciting, challenging, yet rewarding world of health and wellness began in 2005 after returning from an adventurous year traveling abroad. Impulsively enrolling in school for massage therapy as well as attending her first yoga class the same year, Niki quickly realized this was not just another spontaneous, short lived experience, but rather a life calling. From owning a small business to working alongside chiropractors and professional athletes. High end resorts and spas to the humble jungles and small islands throughout Central America, Niki's passion for bodywork, yoga and all things healing for the soul, mind, body continues to grow more and more each day. Her desire is not simply to "help" others, but to inspire anyone around her to continuously live their fullest life through the healing art of yoga, massage, and meditation. Tratamientos con aceites esenciales de grado terapeutico (dooterra). 15 anos de experiencia como terapeuta. Masaje purepecha (masaje tradicional indigena). Las Flores de Bach son una serie de esencias naturales utilizadas para tratar diversas situaciones emocionales, como miedos, soledad, desesperación, estrés, depresión y obsesiones. Fueron descubiertas por Edward Bachentre los años 1926 y 1934. El Dr. Bach era un gran investigador, además de médico y homeópata. Experimentó con diversas flores silvestres nativas de la región de Gales, en Gran Bretaña, de donde él era originario, hasta encontrar 38 remedios naturales, cada uno con propiedades curativas para distintos problemas emocionales. A estas 38 floresse les llaman Flores de Bach. CRISTALOTERAPIA (también llamada Gemoterapia) es una herramienta bioenergética basada en el conocimiento ancestral del uso de cristales para regular el estado energético, emocional y físico de la persona, al actuar sobre el campo bioenergético (aura) y sus centros energéticos (chakras). MASAJE MAYA CON OBSIDIANA ( piedras calientes ) . Un masaje con piedras calientes combina técnicas de termoterapia y masaje para proporcionar una curación efectiva el uso de piedras de obsidiana en el masaje usa la poderosa energia de la tierra que ayuda al paciente en su curación. El calor de las piedras también tiene el beneficio de geomagnetismo de la fuente de la Tierra ; tiene un efecto de equilibrio y sanación en nuestros sistemas. masaje de presión fuerte , hace un recorrido por todo el cuerpo siempre teniendo cuidado de aplicar la presión correcta en todas las áreas . Una terapia es más que suficiente para liberar grandes cantidades de estrés. El propósito principal de la terapia masaje deportivo es ayudar a aliviar el estrés y la tensión que se acumula en los tejidos blandos del cuerpo durante la actividad física . En caso de lesiones y lesiones menores ocurridos debido a esfuerzos excesivos. TRATAMIENTO FACIAL LA ETERNA JUVENTUD proporciona un efecto reafirmante instantáneo en la piel y de acción prolongada , protegiendo la piel y las células con antioxidantes y estimulando el aumento de la formación de colágeno lo que suavisa las arrugas, equilibrado la piel por 12 hrs.